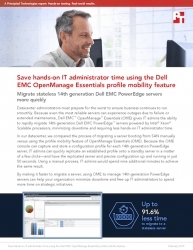 In hands-on testing, PT found that using Dell EMC OpenManage Essentials profile mobility to migrate stateless 14th generation Dell EMC PowerEdge servers could save hands-on administrator time. Durham, NC, February 02, 2018 --(PR.com)-- Servers sometimes experience outages due to extended maintenance windows or unexpected failures, and datacenter admins must get an identically configured standby server up and running quickly. Principled Technologies (PT) compared two ways to migrate stateless servers booting from SAN: using Dell EMC OpenManage Essentials profile mobility, which is available for 14th generation Dell EMC PowerEdge servers powered by Intel, and using a manual approach. To learn more about how businesses can save hands-on administrator time and minimize downtime, read the full report at http://facts.pt/wwskKH and see the infographic at http://facts.pt/46A89b.